If you read up on "Salty Candied Almonds", you would know that today we are going to a friend's annual pig roast. I know that these cupcakes will be a perfect accompaniment to the pork. "CUPCAKES?" you might ask. But these are no ordinary cupcakes. In fact, I only call them cupcakes because they are just too good to be muffins (or should I say BAD)? I typically make this recipe (minus the frosting) just as a cornbread in a 13x9" pan. But, this is a special occasion! 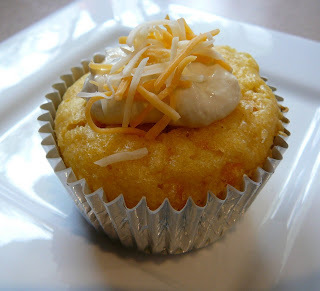 We went camping a few weeks ago with friends and found out that this cornbread is also great for BREAKFAST! Basically, this cornbread would taste good if eaten with a rubber boot, throw pillow, pile of mud, etc. Preheat oven to 350 degrees. Mix all cornbread ingredients together. Fill lined muffin cups to the brim with cornbread mixture. Bake 30 minutes. For frosting, beat together cream cheese, sour cream, and green chili puree. Refrigerate. When cupcakes are cool, place a dollop of frosting in the center of each. Sprinkle with shredded cheddar cheese.